The Sweden Kream, Memphis, Tenn.
There’s nothing particularly special about a cup from the Sweden Kream, at least, nothing special enough to make it stand out on the scavenger hunt list. Mine was medium-sized and made of plain white Styrofoam. It’s not the cup that’s important, though – it’s the milkshake inside. It’s hard to classify the Sweden Kream. It would be wrong to call it a burger joint, because they also serve hot wings, tamales, breakfast, ice cream, shakes, and snow cones. The menu is taped to the window, and over the years, various items have been added to it on neon poster board. All of the lettering and art (including a giant mouth licking a chicken wing) are hand-painted. The place looks like it’s been open since man first realized that snow cones and burgers are necessary to surviving summer in the South. Despite having a small dining room, it’s not exactly a restaurant, either. You place your order at a window, then stand around and wait for the window to open and your initials to be called. A combo from Sweden Kream, Memphis, Tenn. It took about 20 minutes for the woman inside to yell my initials and stick a paper bag and cup through the window. 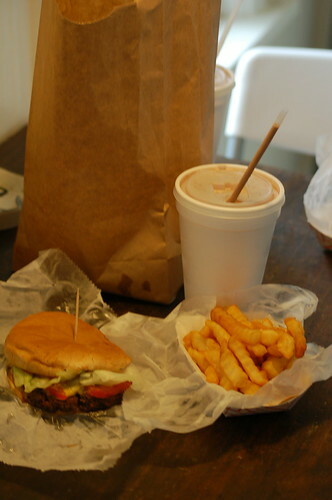 I got the cheeseburger combo, which came with a juicy, greasy cheeseburger, some old-school crinkle cut fries and the best chocolate shake I’ve ever had. Its simplicity was amazing – there were no superfluous toppings, just plenty of creamy chocolate goodness. 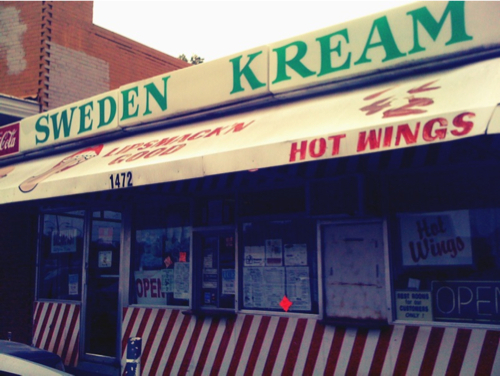 The Sweden Kream is located in North Memphis, on National. It’s open Monday – Saturday, from 10 a.m. – 7 p.m. When I was there around lunchtime, it was busy, but not overly crowded. As the summer goes on, though, I could see the lines for snow cones and milkshakes getting long. If you’re not into waiting, you can call in your order. Ed. Note: This post was originally published in April 2010. Oh, wow! I lived in Memphis 17 years and never knew there was a Sweden Kreme! Little Rock also has one, and when I lived there it was a favorite place for the newsroom crew to go on dinner breaks. I thought it was unique. Sweden Kream will be playing at the Alex Chilton Memorial May 1st at Nocturnal. Thanks for posting this! Brings back a lot of good memories. As a kid, I was constantly scraping together spare change and riding my bike over to Sweden Kream for a milkshake. The burgers were great too. Now I’m homesick. Thanks a lot. Aw yes. Sweden Kreme. My dad use to take us there as kids in the 60’s and 70’s for their famous “Purple Cow” milkshake. It was kind of dumpy even back then. Good times. I heard The Yardbirds ate there when they recorded here in Memphis at Sam Phillips in 1965. Sweden will have musical artists honored in Carl Perkins home city, Jackson, Tennessee on August 9,10, 11 -2012. There will be in excess of 80 people here for their induction into the International Rock-A-Billy Hall of Fame. A 30 Minute TV show will be filmed of their performance produced by Steve Bowers on JEA TV. It will be shown in Jackson and given to them to use in Sweden on their return. Would you consider making these Swedish Artists welcome in Jackson? Kindest Regards, Henry Harrison, President, International Rock-A-Billy Hall of Fame.